Happy Valentine’s Day! 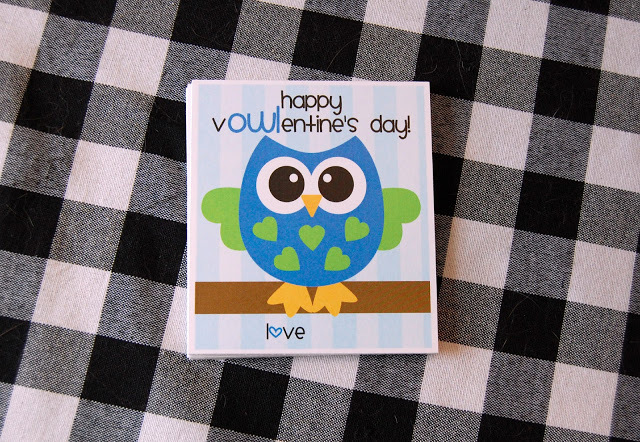 Or should I say happy Vowlentine’s Day? I’m linking up with Katie and Stephanie for Saw it, Pinned it, Did it, so that I can show off the super cute and super easy owl Valentine’s Day cards that Hudson is giving to his daycare buddies! Hudson is so excited to eat pass these out today. Here is the original pin, via artsy-fartsy mama. She made a girl version and a boy version….obviously I selected the boy ones….but man, the girl ones were super sweet. 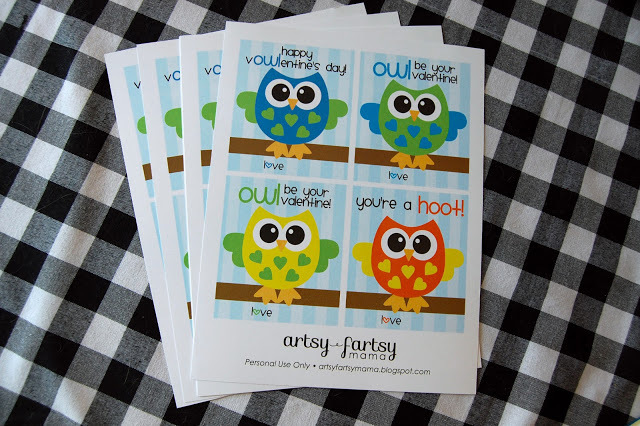 Then I simply downloaded the free printable and sent them electronically to Fedex to print. Easy peasy. And it only cost a few dollars! 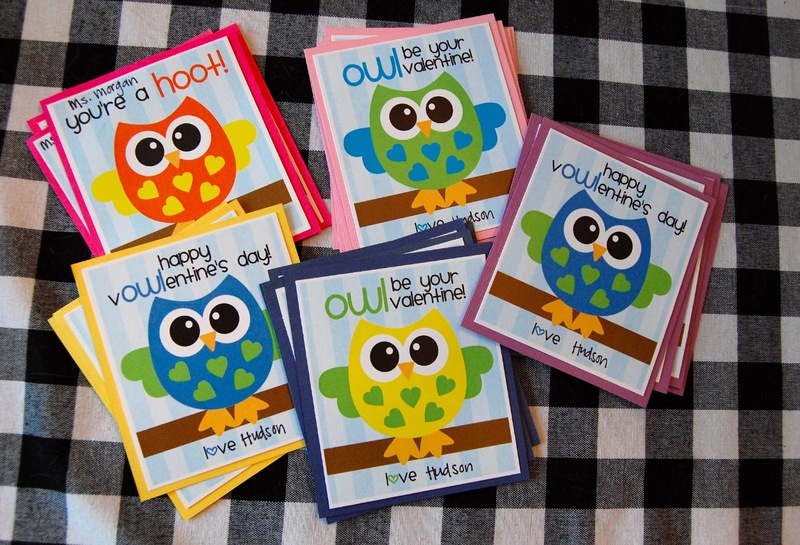 Then I cut them out….and totally could have attached candy to them by cutting a space around the owl’s feet…except that most 5 month-olds I know don’t eat candy. I thought they needed a little extra pop, so I backed them on different colored paper…and I LOVE how they turned out! And of course I have to include a photo of my little valentine! I could just eat him up, he’s so dang cute! Lovin’ his little Valentine’s Day outfit! The personalized onesie is from Leah‘s shop Simply Made with Love. Thanks Leah! p.s. don’t forget to enter my Crystal Faye bracelet and bangle giveaway here. He is so cute and squishy, love it! Those are so cute!! And so is your lil valentine!! Super cute! I want to squeeze that adorable little baby so much!! Happy Valentine's Day, friend!! Look at those chubby thighs! So cute!! Happy Valentines Day! Oh he is just darling. The outfit and beanie are too stinkin cute. So cute & so sweet! 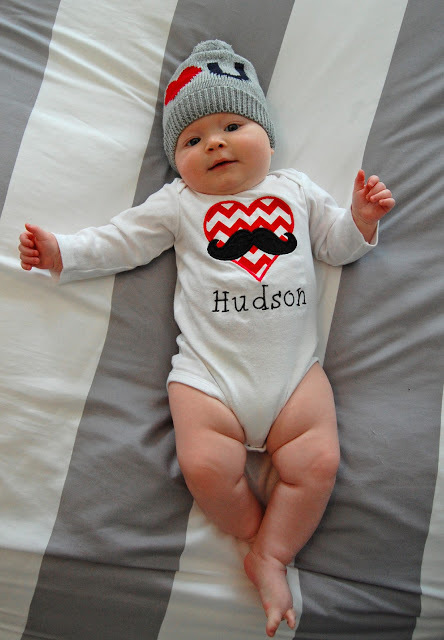 Happy 1st Valentine's Day Hudson. Aunt Erin is delivering your gift from us tonight.Our love to all of you! What a CUTE idea! Love this. You're so creative. And can we just talk about his little legs? There is nothing cuter than chubby baby legs. LOVEEE!!! Such a sweet idea. I love his hat! I remember seeing that a while ago but couldn't remember where. So adorable!! Love the cards and the outfit! 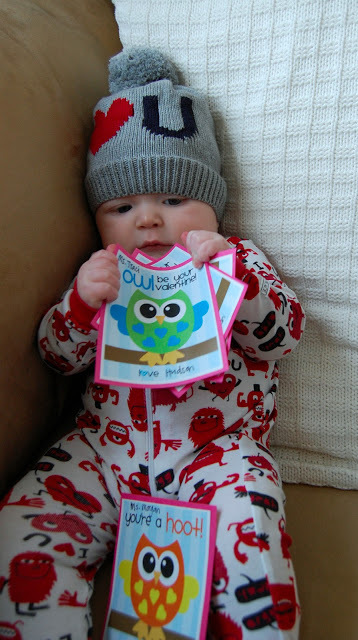 Happy 1st Valentine's Day Hudson! I don't think he could be any cuter! oh gosh, that onesie is adorable!! He is adorable! That onesie and that hat are too precious! I love those chubby little legs! So so cute that onesie! OMG he is getting so big! 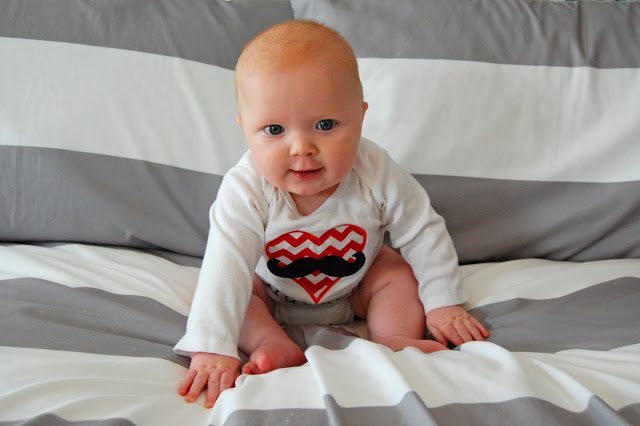 I love his little chevron onesie and those valentines too. Adorable! Your little man is ADORABLE! Where did you get that super cute <3 U hat? Love it! Oh how cute he looks! Love the prints outs! Free is always cute! his pjs are so cute! i love his chubby legs too 😀 he's a doll! awww your baby is so adorable! !